The horned melon is also known as the kiwano, African horned cucumber or melon, jelly melon, hedged gourd, melano, and blowfish fruit. It is an annual vine in the cucumber and melon family. 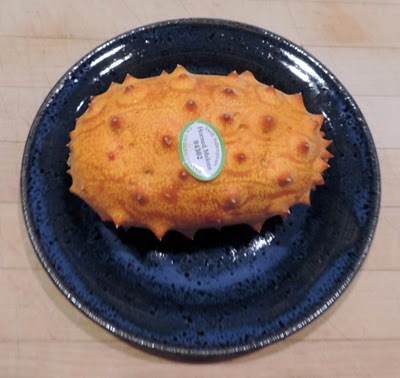 Horned melon connoisseurs describe the flavor of the slimy green interior in this fruit as a cross between cucumber, zucchini, and kiwifruit. Unfortunately, this fruit is filled with entirely too many seeds for Oma’s palate! Interesting fact: This fruit which looks like it belongs in space, was featured in an episode of Star Trek.